Inject some fun into your hair with the TIGI Bed Head range, a collection of bright and beautiful products that smell great, look fantastic, and give a confidence boost that goes straight to your head. Whatever your hair type TIGI Bed Head has a range made for you, get spectacularly healthier and improved hair that will get you noticed. 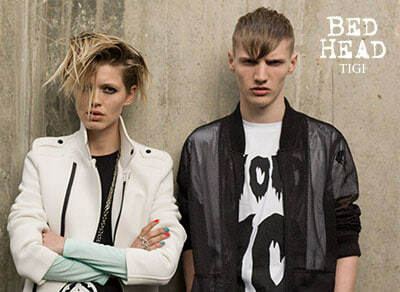 With their fruity scents, bright colours and eccentric names, TIGI Bed Head is the liveliest brand in the TIGI family. It is created especially for those who like to mess up their hair and have fun while they're doing it! TIGI Bed Head gives hair all of the support it needs to look at its very best, while infusing it with health, shine, and manageability. Each product has a specially tailored scent that laces hair with a decadent aroma. From the Strawberry Yoghurt fragrance of the Epic Volume shampoo to the Blueberry aroma of Small Talk hair energiser, your TIGI Bed Head products will become your new signature scent. The iconic collection includes star ranges Colour Goddess, Urban Antidotes, and B for Men, plus the delectable new styling range Candy Fixations. With a wealth of hair care expertise poured into every product, Bed Head are the go-to guys for a good hair day.